Anyways, so since summer is officially here that means shorts will make up the majority of my wardrobe and I don’t know about you girls, but shorts are not exactly my favorite thing. I struggle with them all being too tight in the thighs which I can.not.stand. or if they fit in the thighs they are way too big in the waist #struggles. So rompers like this one, I can totally get behind. It’s loose and flowy, not at all restricting. 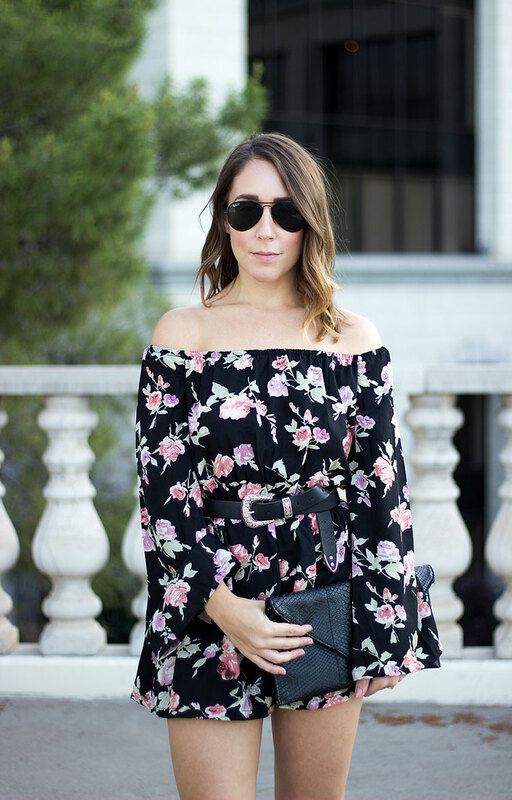 Plus it’s off-the-shoulder and has the prettiest pink floral pattern. On a side note, I think this romper would look great with a pair of sneakers for a more casual, cool girl look, buuut I’m not really a “cool girl” so dressing it up was more my style. TGIF! I hope you all have a great weekend! I’ll be soaking in the last bit of the time I have with my family and then it’s back to reality on Sunday. 100 degrees??!! We've barely scratched 60° here in Chicago, I think we need to meet in the middle 🙂 loving all of your florals lately Shannon! Hope you guys have a great weekend. I just purchased a navy floral romper today! It isn't off the shoulder, because I'm not ready to tackle that trend yet. (; I can't believe how warm it is there… our weather man said I "might" snow Sunday morning…. yes, snow…. I really need to try on a romper, you look so dang good in one! Have a great weekend, Shannon! So cute! I love the romper and how you belted it! Your quotes are always the bomb! I love that you dressed this romper up with the heels, they're so chic! What a pretty look, perfect for Spring!